THEY CALL HER "EVA INTO THE WALL"
"I'm supporting Eva Joly. The only ecological and citizen candidate, for the time being." When Daniel Cohn-Bendit speaks, usually, the Greens listen carefully! When he utters this sentence, they understand that the former May 68 leader is in the process of abandoning the candidate in the ecologists' primaries in favor of Nicolas Hulot, should the TV host throw his hat into the ring. What Cohn-Bendit is really expressing is a growing malaise in the ranks of Europe Ecologie-Les Verts (EELV). Some organizers, even among Eva Joly's close associates, fear that the member of the European Parliament is trapping herself in an ethical discourse whose only result is to irritate and confuse activists. "We're running into a brick wall," some ecologists are muttering. The harshest are calling her "Eva into-the-wall" ('Eva dans le mur')... You get an idea of the atmosphere. It's as though the examining magistrate, the judicial expert, were systematically getting the upper hand over the ecological candidate. 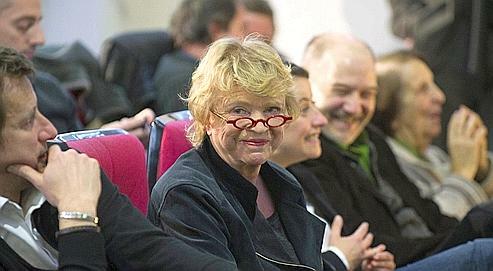 As much as they are grateful for her having carried the lance and maintained the dual role during the Bettencourt affair (which earned her an indictment for defaming Florence Woerth, the ex-Labor Minister's wife), they forgive much less her latest slip about Jacques Chirac, whom she suspected of wanting to play "the accused person's illness card" in order to delay the opening of his trial for the affair of presumably fictitious jobs at the City Hall of Paris, which is expected to begin in March, adding as a dubious parallel that "Pinochet was also very very sick, and lived many long years afterwards." Even Arnaud Montebourg and Jean-Luc Mélenchon wouldn't have dared to go so far. For many, it's one slip too many. Already, they polls had sounded a first alarm. The most recent show Eva Joly down to under 5% among likely voters! The downward trend has continued since the begining of the campaign. It's enough to worry people after the successes at the polls in European and regional elections. "Taratata!" The former magistrate pulls up short, as if this were not an appropriate subject of conversation. "But I'm not campaigning," says Eva Joly, upset. "I'm in pre-campaign mode. We're having primaries." The same line is repeated by Yannick Jadot, her campaign director, who contextualizes the air pocket Eva Joly is passing through and predicts that the magistrate is going to surprise people. Besides, both of them question certain polls and put forward others that give Eva Joly a better score than Nicolas Hulot, should he run. Still, there's the atmosphere in ecological circles, which is worsening with Eva Joly's declining poll numbers. Already leaders are talking about voting again to change the calendar of primaries in order to delay them until the fall. In order to allow Hulot time to decide and get ready. To clear things with his foundation and make contacts. All Eva Joly's life is marked by the awareness that she is not necessarily the smartest, the most gifted, but that once she's is nominated, chosen, promoted, whatever, she cannot evade her new duties. "My mission on earth," she says, "my mission on earth," she insists, weighing her words, "is a fight for social justice." She has lived her life, the former examining magistrate explains, as a fight. But what accounts for this fierce willfulness, this strong and unshakable faith, is the almost messianic side of her commitment! Her political commitment is an extension of her former lives. She is all the more sure of having been invested with a higher "mission" for having no ambition whatever for herself. No, ambition is not what is driving her. Her candidacy is the fruit of "a collection of chances," she explains, before hesitating and wondering, "but it must not be totally for nothing that I'm in the position I'm in today"... She's referring, perhaps, to a certain divine plan of which she would be the chosen one, the new "Joan of Arc of morality and sincerity," to repeat Alain Duhamel's phrase, which fits Eva Joly to a T.
Besides, as for voices, the former examining magistrate heard a whole welter of them before deciding to run for the presidency: first, there was the voice of "Yannick" Jadot, who sits next to her in the European Parliament, and who, before any others, asked her to think about the possibility; then there were the voices of dozens of ecologist activists; the voices of her daughter and her son, of course. "they were very supportive, real supporters, telling me that I had the right stuff and that they would be behind me"; and finally, the decisive word from "Dany" (in the wonderful world of Europe Ecologie-Les Verts, they call him by his first name. "He painted a picture of everything that awaited me. 'Eva, you'll see, it's crazy, you'll have to call more than 200 meetings. It's an ordeal, a campaign...' But to discourage me from doing it, he would have done better to tell me that someone could do it better than I could. Material obstacles have never discouraged me." "IN AN INTERVIEW, BEGIN WITH A SMILE!" Eva Joly would more have seen herself as "the number two climber," behind, precisely, "Dany." "That was my place," she says, but she says Cohn-Bendit dismissed her suit with a "Never!" whose causes she doesn't completely explain. So, for a lack of fighters, who better than she could "accede" to power? Since then, the judge has, with difficulty, poured herself into the candidate's mold. Seated at a little booth at La Rotonde, where the boulevard Montparnasse meets the boulevard Raspail, Eva Joly has trouble relaxing completely. She tries to smile, she works at it. She must surely be thinking of the advice that Noël Mamère must have given her the day before. "In an interview, begin with a smile!" To humanize the shell. But it's hard to wipe away in a few sessions of media training the reputation of being uncompromising that she's built in her ten years at the financial hub of Paris, submitting politicians and big-business bosses to forceful, pitiless interrogations, arriving at the crack of dawn to suprise the powerful in a state of undress. Loïk Le Floch-Prigent, Bernard Tapie, Roland Dumas all remember her authoritarian, even brutal ways. Eva Joly knows it. And she complains about it, suffering from the injustice that is done to her, she who, she swears, is in reality much more gentle than she seems. Funnier, too. "Do you really tchink tchat I'm like tchat harsh woman tche media talk about?" she asks, with an echo of that northern accent that always catches people off guard. What would the French think about that accent in a presidential campaign? To prove the opposite, the EELV member of the European Parliament smiles again. Tries so hard, when she concentrates on listening and preparing her answers, that her little red glasses mounted on the end of her nose bounce up and down as her lips contract, as though tics were running through them. But apart from this ex-magistrate image that she would like to be able to correct, Eva Joly has no doubt about anything. Especially about herself. Already, at the time of the complicated Elf affair, her colleagues in the judiciary predicted that she would come a cropper, that she was not sufficiently equipped and had too few resources at her disposal. "And a woman, to boot!" How many times has she heard behind her back that sort of macho remark. But the former au pair who arrived in France from Oslo with no degree [Born in a poor neighborhood of Oslo in 1943, Gro Eva Farseth came to France in 1961; Joly married Pascal Joly, a French medical student, in 1967. He was a son of the family where she was au pair; they have two children, Caroline (a lawyer) and Julien (an architect). Her husband, from whom she was separated, committed suicide in 2001. --M.J.], was going to prove that she was afraid of nothing. She advances like a bulldozer. And learns fast. Certainly, the recent member of the European parliament recognizes, she's not a professinal politician. "I'm a bit of a novice." But the presidential election is a collective adventure. She knows she can count on the expereince of "Dominique" (Voynet) and "Noël" (Mamère), former presidential candidates for the ecologists, who joined the little team that meets every Monday to prepare her for the campaign. "I'm not begnning from scratch," she says once more in her amazing franglais accent. "I need to feel the entire history of the movement." So she must remember 2002. No one has dared reminder her of the story of Alain Lipietz, the Green's chosen candidate for the presidential election, abandoned by his own when the polls became too catastrophic and replaced in extremis by Noël Mamère. She doesn't want to believe that this scenario is in the works, when she has not even been chosen and when the primary has not yet taken place. For Eva Joly, "Dany is a brother. My legitimacy I owe to him. He supports me because I'm the only candidate, because there's no one else to support. But he's only thinking about what would happen if Nicolas Hulot were candidate in the primaries and won. Then, yes, he'd support him..." With friends like that, Eva Joly doesn't need enemies.